Appeared in two games for Panama in the 2009 World Baseball Classic…also played in the 2000 Little League World Series for Panama…his father, Ruben Sr., pitched for Los Indios de Veraguas in Panama. Appeared in 37 games with Triple-A Scranton/WB before being traded to Baltimore ... Averaged a combined .260 (75-for-288) between Triple-A Scranton/WB, Triple-A Norfolk, and Baltimore ... Made his Orioles debut on 6/7 vs. PIT, going 0-for-4 ... Began the season with season-high six-game hit streak, going 7-for-16 (.438) with two doubles, one home run, and five RBI ... Slugged a season-high two home runs on 5/6 vs. Syracuse, going 2-for-4 with two home runs, two runs scored, a season-high-tying four RBI, and one walk ... Collected six multi-hit games with Baltimore, four with Norfolk, and 10 with Scranton/WB. Finished the season with 23 doubles, the second-highest total in his career....Batted .287 (50-174) with 10 doubles and 14 RBI after the All-Star break....Had a 10-game hitting streak from July 8-July 22 where he hit .333 (14-42)...Was part of a 15-game on-base streak from July 3-July 22....Hit .340 (17-50) with seven runs scored, four doubles, one home run and six RBI in 25 games in September with a .411 OBP...His average was tied for the seventh-highest in the NL in September (min. 50 at-bats)....Hit his first career inside-the-park home run on September 2 vs. Philadelphia...Finished the game 2-for-4 with a season-best four RBI...Was the first inside-the-park home run for a Met since Angel Pagan on May 19, 2010. Appeared in his first career postseason game when he started at shortstop in Game 1 of the NLDS at Los Angeles....Suffered a broken right fibula in Game 2 of the NLDS vs. Los Angeles in a seventh-inning collision with Chase Utley and did not play the rest of the postseason. Made his fourth consecutive Opening Day roster and was the starting shortstop for the season opener for the third straight year...Set career-high totals in games, home runs and walks...Entered the season with two career home runs...Hit five this year, including his first ever at Citi Field...Hit a two-run home run off Jose De Leon on September 28 vs. Houston in his last at-bat of the season...Went 778 at-bats at Citi Field without a home run prior to his blast...Collected his third career game-ending RBI on May 11 vs. Philadelphia and reached base four times...Singled with the bases loaded in the 11th inning against Jeff Manship...Also drove home the game-ending run, July 7 vs. Atlanta with an 11th-inning single against Anthony Varvaro...His home run on May 31 at Philadelphia snapped a string of 552 homerless at-bats, the longest active streak in the majors at the time...Added another one two games later after hitting two in his first 388 career games...Hit in a season-high 10 straight games (.351, 13-37), June 20-July 1...It was his fourth career streak of at least 10 games...Started in six different spots of the batting order this season (first, second, sixth, seventh, eighth, ninth)...Reached a career high-tying five times on May 31 at Philadelphia...Hit .325 (13-40) with two home runs and eight RBI in September...Finished with a .984 fielding percentage, the highest of his career. Made his third Opening Day roster and was the starting shortstop in the season opener for the second consecutive season...Also spent time at Las Vegas (AAA) of the Pacific Coast League...A broken right fibula on September 18 ended his season. Appeared in a career-low 57 games and hit a personal-worst .202 (42-208). Placed on the 15-Day Disabled List on May 30 with right quad strain...Returned from his rehabilitation assignment on July 7 and optioned to Las Vegas (AAA) of the Pacific Coast League...Recalled from Las Vegas on September 10...Hit .288 (69-240) with two home runs and 24 RBI in 60 games for the 51s. Had a season high-tying three hits, April 29 at Miami and again May 25 vs. Atlanta. Hit in six straight, April 24-April 29...Went 9-23 (.391) with three doubles during his run. Made his second Opening Day roster, and was in the starting line-up for thefirst time in his career...Left the game on May 6 vs. Arizona with a right quad strain...Placed on the15-Day Disabled List the next day...Returned on June 24 vs. New York (AL)...Hit in a career-high 14 straight games from July 26-August 9 (.365, 23-63)...Hit in 10 straight from September 17-September 28 (.400, 16-40)...Recorded his second career game-ending hit, a single, on September 23vs. Miami...Set career-highs in games, at-bats, runs, hits, doubles and batting average...Hit the first leadoff home run of his career, August 1 at San Francisco offMatt Cain...It snapped a string of 629 at-bats without a home run, datingto September 5, 2010...Collected a career-best four hits on April 8 vs. Atlanta, April 27 at Colorado,June 29 at Los Angeles (NL) and September 26 vs. Pittsburgh... Also had 10,three-hit games...Tied for the league lead among NL shortstops with 14games with at least three hits...The last Mets shortstop to have two four-hit games in April was Jose Reyesin 2007...Jose Vizcaino was the only other shortstop in team history toaccomplish the feat (1996)...Drove in a season-best three runs on April 21 vs. San Francisco...Finished the Colorado series, April 27-April 29, 10-17 (.588)...The last Metsplayer to have 10 or more hits in a three-game series was Edgardo Alfonzo,who also had 10 hits against Colorado, April 28-April 30, 2000...Since 1975, only three other players age 22 or younger finished with 10 hitsin a three-game span: Alex Rodriguez, Carl Crawford and Evan Longoria...Hit .421 (16-38) with six runs scored in his last nine games before goingon the DL...Hit in 16 straight road games from July 19-August 17 (26-74, .351)...Had a hit in 20 of 21 games from July 26-August 17...Batted .330 (31-94)over that stretch...Hit .320 (49-153) against lefthanders...His .325 (53-163) was the seventh-highest mark in the NL prior to the AllStar break (minimum 175 plate appearances)...Hit .305 (32-105) in 27 games before his injury and .284 (102-359) in 87games following the injury. Began the season with Buffalo (AAA) of the International League before being recalled on May 17...Hit .250 (42-168) in 51 games before being optioned to Buffalo on July 20...Returned for the remainder of the seasonon August 8...Hit .319 (51-160) in his second stint with the team...Over his final 42 games of the season, dating back to August 10, hehit .327 (50-153)...That average was the ninth-best in the NationalLeague over that time span...Tied his career-high with three hits four times: May 30 vs. Pittsburgh,August 10 vs. San Diego, August 26 vs. Atlanta and September 26 vs.Cincinnati...Finished the year with a hit in 14 of 16 games dating back toSeptember 10...Batted .343 (23-67) during that span...Had a season-high eight-game hitting streak from September 10-September 18...Hit .361 (13-36) during his run...Drove in a season-best four runs on September 18 at Atlanta...Went 6-11 (.545) with 16 RBI with the bases loaded...Hit .305(46-151) with runners on base...Tied a franchise record with two hit-by-pitches, September 1 vs. Florida...Drove in 27 of his 36 runs in Mets wins...Finished with nine RBI overa five-game span, September 16-September 22...Hit .348 (24-69) in August, the 10th best average in the NL...Had a two-run double in the ninth inning on September 22 at St. Louisto tie the game as part of New York's six-run frame in an 8-6 win...Finished the season 27-84 (.321) when he hit second...Hit .246 (51-207) with three home runs in 54 games for the Bisons. Appeared on the Opening Day roster for the first time in his career...At thetime, was the youngest player in the major leagues to make the OpeningDay roster at 20 years, five months and nine days (Chicago's Starlin Castrobecame the youngest player in the majors when he made his debut for theCubs on May 7)...Started 46 games at second base and 24 games at shortstop...Made his major league debut as a pinch-hitter and defensive replacment onApril 7 vs. Florida...Popped out against Leo Nunez in the ninth inning...Started for the first time in the big leagues on April 8 vs. Florida...Playedeight innings at shortstop before being removed for a pinch hitter in theninth inning...At 20 years, 219 days old, he became the youngest player tostart a major league game at shortstop since B.J. Upton did it at age 20years, 40 days old on September 30, 2004 for Tampa Bay in the secondgame of a doubleheader against Detroit...Collected his first major league hit on April 9 vs. Washington...Singled offTyler Walker in the eighth inning and finished the game 1-3 with a walk...Was optioned to Buffalo (AAA) of the International League on April 10...Recalled by the Mets on June 4...Went 1-4 with his first career extra-basehit, a double in the third inning, and his first career RBI that evening vs. Florida...Collected his first multi-hit game, a 2-3 effort, on June 17 at Cleveland...Had a 10-game hitting streak from June 12-June 27...Hit .333 (11-33) withnine runs scored over the stretch...It was the longest hitting streak by a Metsrookie since Jason Phillips also had a 10-game stretch from August 9-August20, 2003...Stole the first base of his career on July 11 at Atlanta...Optioned to Buffalo for the second time on July 19...Was recalled for thefinal time on August 7 and started that evening at Philadelphia...Snapped an 0-28 drought dating to his final at-bat on July 16 at San Franciscowith a double on August 19 at Houston...It was the longest drought by a Metposition player since Jason Phillips went 0-29 from April 14-April 26, 2004...Hit his first major league home run on September 5 at Chicago...It was a solo shot off of Marcos Mateo...Became the second Met to drive in five RBI this season when he plated a career-high five runs on September 5 atChicago...Collected a career-high three hits on September 14 vs. Pittsburgh...Also had three hits on September 28 vs. Milwaukee...After beginning his time in Buffalo with a 2-25 (.080) stretch over his first eight games, he hit .306 (59-193) over hisfinal 57 games with the Bisons...Tied his minor league career-high with a 4-4 effort on May 10 at Louisville...Hit .316 (31-98) in 29 games with the Bisons during May. Started the season at Binghamton (AA) of the Eastern League, where he wasthe youngest position player in all of Double-A...After hitting .222 (14-63) in April, he compiled a .299 (127-425) battingaverage the remaining five months of the year...Hit .309 in 28 games in May and .319 with 16 runs scored in 27 games inAugust...Also hit .309 (68-220) with runners on base and .289 (35-121) with men inscoring position...For the season, he had 31 multiple-hit games: 19 games with two hits, 10 gameswith three hits and two contests with four hits; July 12th vs. Reading and August9th vs. New Britain...Compiled the same average vs. lefthanded (.289, 39-135) and righthandedpitching (.289, 102-353)...Made 120 starts at shortstop and 14 at second base...Reached base safely in 20 straight games from April 18th-May 10th with anon-base percentage of .438 over that stretch...Had four straight two-hit games from June 17th-June 21st...Put together a 10-game hitting streak from June 2nd-June 11th (.353, 12-34)...Hit .254 (15-59) with nine runs, one home run, and nine RBI in 17 games withSurprise of the Arizona Fall League. Was the 2007 Sterling Award winner for the Venezuelan Summer League. March 23, 2019 New York Mets signed free agent 2B Ruben Tejada to a minor league contract. 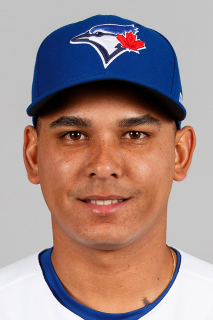 November 2, 2018 2B Ruben Tejada elected free agency. April 2, 2018 2B Ruben Tejada assigned to Norfolk Tides. November 28, 2017 Baltimore Orioles signed free agent SS Ruben Tejada to a minor league contract and invited him to spring training. October 3, 2017 SS Ruben Tejada elected free agency. August 17, 2017 Baltimore Orioles sent SS Ruben Tejada outright to Norfolk Tides. June 6, 2017 Baltimore Orioles selected the contract of SS Ruben Tejada from Norfolk Tides. June 5, 2017 SS Ruben Tejada assigned to Norfolk Tides. June 4, 2017 New York Yankees traded SS Ruben Tejada to Baltimore Orioles for cash. December 19, 2016 SS Ruben Tejada assigned to Scranton/Wilkes-Barre RailRiders. December 12, 2016 New York Yankees signed free agent 3B Ruben Tejada to a minor league contract and invited him to spring training. October 3, 2016 SS Ruben Tejada elected free agency. July 27, 2016 San Francisco Giants sent SS Ruben Tejada outright to Sacramento River Cats. July 20, 2016 San Francisco Giants designated SS Ruben Tejada for assignment. June 29, 2016 San Francisco Giants selected the contract of SS Ruben Tejada from Sacramento River Cats. June 16, 2016 San Francisco Giants signed free agent SS Ruben Tejada to a minor league contract. June 16, 2016 SS Ruben Tejada assigned to Sacramento River Cats. June 1, 2016 St. Louis Cardinals released SS Ruben Tejada. May 28, 2016 St. Louis Cardinals designated SS Ruben Tejada for assignment. April 18, 2016 St. Louis Cardinals activated SS Ruben Tejada from the 15-day disabled list. April 14, 2016 St. Louis Cardinals sent SS Ruben Tejada on a rehab assignment to Springfield Cardinals. March 19, 2016 St. Louis Cardinals signed free agent SS Ruben Tejada. March 16, 2016 New York Mets released SS Ruben Tejada. November 2, 2015 New York Mets activated SS Ruben Tejada. October 12, 2015 New York Mets reassigned SS Ruben Tejada to the minor leagues. June 14, 2015 New York Mets activated SS Ruben Tejada from the paternity list. June 11, 2015 New York Mets placed SS Ruben Tejada on the paternity list. September 10, 2013 New York Mets recalled SS Ruben Tejada from Las Vegas 51s. July 6, 2013 New York Mets optioned Ruben Tejada to Las Vegas 51s. July 2, 2013 New York Mets sent SS Ruben Tejada on a rehab assignment to Las Vegas 51s. June 28, 2013 New York Mets sent SS Ruben Tejada on a rehab assignment to GCL Mets. May 30, 2013 Ruben Tejada roster status changed by New York Mets. May 6, 2013 SS Ruben Tejada assigned to Las Vegas 51s. June 24, 2012 New York Mets activated SS Ruben Tejada from the 15-day disabled list. June 20, 2012 St. Lucie Mets sent SS Ruben Tejada on a rehab assignment to Buffalo Bisons. June 18, 2012 Ruben Tejada assigned to St. Lucie Mets. June 4, 2012 sent SS Ruben Tejada on a rehab assignment to Buffalo Bisons. May 7, 2012 New York Mets placed SS Ruben Tejada on the 15-day disabled list. Strained right quadriceps. August 8, 2011 New York Mets recalled Ruben Tejada from Buffalo Bisons. July 20, 2011 New York Mets optioned Ruben Tejada to Buffalo Bisons. May 17, 2011 New York Mets recalled Ruben Tejada from Buffalo Bisons. March 11, 2011 New York Mets optioned Ruben Tejada to Buffalo Bisons. August 7, 2010 New York Mets recalled Ruben Tejada from Buffalo Bisons. July 19, 2010 New York Mets optioned Ruben Tejada to Buffalo Bisons. June 4, 2010 New York Mets recalled Ruben Tejada from Buffalo Bisons. April 10, 2010 New York Mets optioned Ruben Tejada to Buffalo Bisons. April 4, 2010 New York Mets selected the contract of Ruben Tejada from Binghamton Mets. February 4, 2010 New York Mets invited non-roster SS Ruben Tejada to spring training. July 11, 2006 New York Mets signed free agent SS Ruben Tejada to a minor league contract.